After a month without posting, March should bring in regular updates featuring a variety of Vikings and Viking related literature. First, the often maligned Wargames Factory's Dark Ages offerings. The Viking Bondi differ from the Anglo-Saxon unarmored set in only the head and accessory sprue. Otherwise, both sets offer the same unarmored/lightly armored bodies in a standing or awkwardly walking pose. To its main credit, this is the only plastic set currently available that one can use to fill out their ranks of Viking thralls/archers. 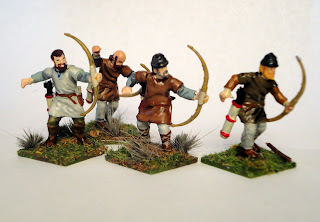 It can be difficult to get natural poses from the figures, but with a little shaving of the arms and a willingness to create some lefty archers, some good results can be achieved. 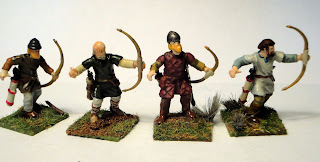 These painted fairly well, at least by my middling standards. The Norse preference for axes and sword permeates popular history and media, but the bow was a prized weapon by even the best warriors. 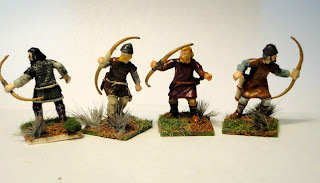 In The Icelandic Njal's Saga, the ever feuding Gunnar, armed with a bow and spear, fights off thirteen enemies, slaying many before they even approach him. My biggest gripe with this line of figures are the heads. It can take a lot of work to get them to sit naturally. Here's a group shot of a point's worth of Saga thralls. A few wear chain, but maybe they were lucky scavengers. Njal's Saga may be my favorite Icelandic saga. Set at the turn of the eleventh century, it is a violent and darkly humorous account of the blood feuds among the self-governing Icelandic settlers. There are no epic battles or king-making moments of glory in this account. It does have more premeditated murder and domestic violence than a hard-boiled mystery novel. 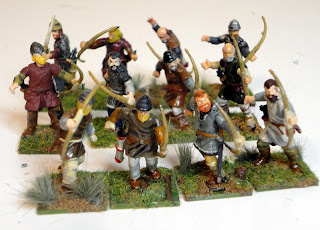 Wargames Factory figures are great for conversion despite some people's criticisms. The lightly dressed Numidians could make great Dark Age slaves. Look forward to seeing them. Thanks!